This delicious dish combines juicy cut with cream cheese and vegetables for a tasty, festive meal. Great for a dinner or Sunday lunch, the meal is loaded with nutritious ingredients and is easy to carve. This is a tasty winter warmer and is quick to prepare if you are pushed for time. Peas and coleslaw make for the perfect combination of tastes and nutrients. Coleslaw has different variations and can be prepared with ingredients such as apple, pineapple, carrots, onion, red cabbage, etc. We offer a healthy low-carb version which tastes absolutely great. Preheat oven to 375 F. Cut a pocket in each pork loin. Fill with cream cheese. Place the pork, coconut oil, salt, pepper and wine in a pan, cover and bake for about an hour and a half. Add water in a skillet and bring to a boil. Add the green peas and cook for 1 minute in boiling water. Drain and put the peas in a dish and add butter, lemon juice and salt. Add the butter while the peas are still hot so it will melt. 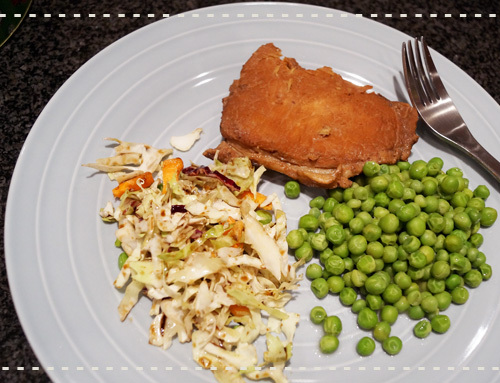 Serve the pork loins with the peas and coleslaw on the side.